(CNS): As the number of arrests mount as a result of Trinidad and Tobago's state of emergency, the islands' attorney general, Anand Ramlogan, has said that courts across the country could hold special night sittings to tackle a mounting workload. Almost 1500 people have now been arrested during the state of emergency, which was introduced on Sunday 21 August in six areas in Trinidad in order to tackle a spate of violence that saw 11 murders in just a few days. 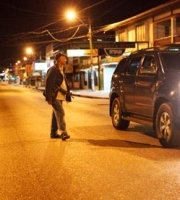 When Prime Minister Kamla Persad-Bissessar first announced the measure, it was to last just 15 days and include a 9pm to 5am curfew in major cities and towns. However, it has now been extended a further 3 months. According to Trinidad and Tobago's Newsday, Ramlogan said the state was considering asking retired magistrates and judges to return to active duty to fill key gaps in the pool of judicial officers. Furthermore, he said that Prime Minister Kamla Persad-Bissessar and Chief Justice Ivor Archie are discussing the establishment of a special court to deal with firearms offences and the issue of night courts and other contemplated measures. There may also be an increased use of video-conferencing technology to have virtual courts inside of prisons. Legislation may also be introduced that enables authorities to take DNA samples from people arrested during the state of emergency. The foreign minister, Surujrattan Rambachan told the New York Times last month that the seizure of $22 million worth of cocaine had set off the violence as gangs sought retribution for the losses. He said 262 people had been killed this year, compared with 325 at this point last year, but he called the rate unacceptable and noted that the prime minister took office last year with a promise to get the problem under control.